Looking to upgrade from paper gift certificates? Custom gift cards are a proven way to generate revenue and bring in new business. When people buy custom gift cards from your brand, they’re doing more than making a purchase — they’re also encouraging future business. Time has shown that gift cardholders will often spend more money than the value of their gift cards when they redeem them, bringing you additional revenue in the process. This is exactly why creating custom gift cards with barcode information is such a smart investment for your company. Gift cards encourage more spending! 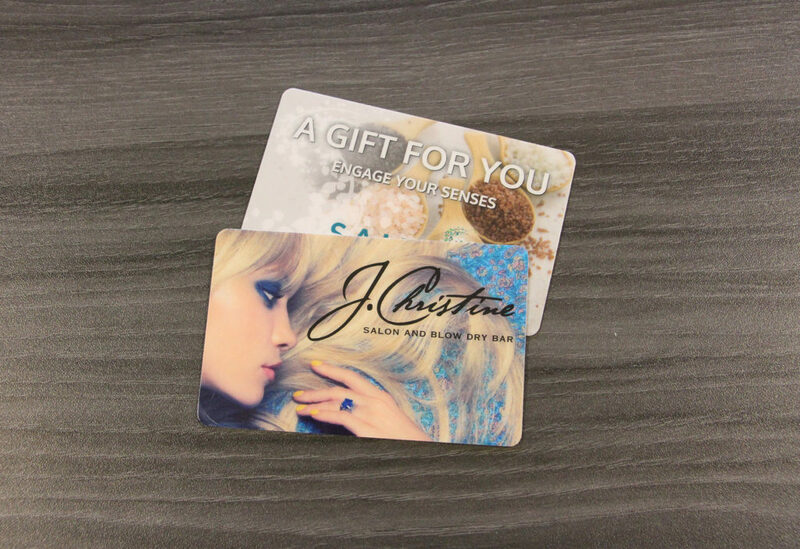 Custom plastic gift cards from Suncoast Identification Solutions are made from a high-quality plastic that won’t crack or break and is more durable than PVC. Your cards can be personalized with your business name, logo and barcode to help you easily track how much money is on the gift card. Likewise, you have the option of printing a card with its particular face value ($25, $50, $100, etc.). Custom plastic gift cards are an essential marketing solution for so many businesses today. Consider the benefits they offer: They allow your customers to reward and give your products and services — all while showcasing your brand. Likewise, their plastic construction ensures that they can hold up to daily wear and tear, surviving in a recipient’s wallet for years. The professional look of a plastic gift card adds credibility to your business. Plus, Suncoast Identification Solutions offers preprinted and custom-printed gift cardholders so that your cards can make a great impression when they are given. When you’re looking for plastic gift cards from a reliable printing company, come to Suncoast Identification Solutions. Far more than the average printer, we’re a business that offers custom gift cards with barcode labeling tailored to your business’s needs. The plastic gift cards we create are available in a range of standard designs, or they can be customized in any shape you want. Each one is able to hold a barcode, sequential numbering or other data for customer tracking, and it can be formatted to work with your existing software. 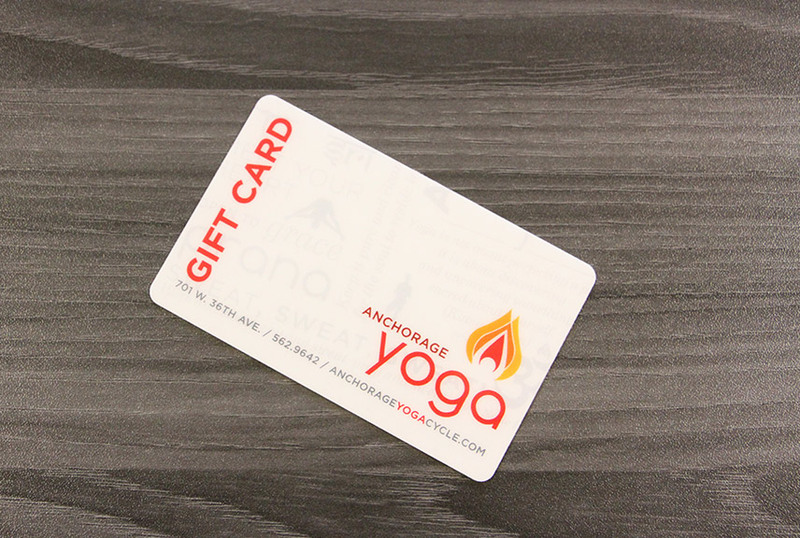 The surfaces of our plastic gift cards are a water-resistant polyester core with a protective, durable and high-gloss laminate that protects your gift card from cracks, spills and peeling. When you’re looking for the best in custom gift cards for your brand, contact us today to learn more! Gift cards are an essential marketing solution for so many businesses. They allow your customers to reward and give out your products and services, all while showcasing your brand. Plastic gift cards hold up to daily wear and tear and can survive in a recipients wallet for years. The professional look of a plastic gift card adds credibility to your business. 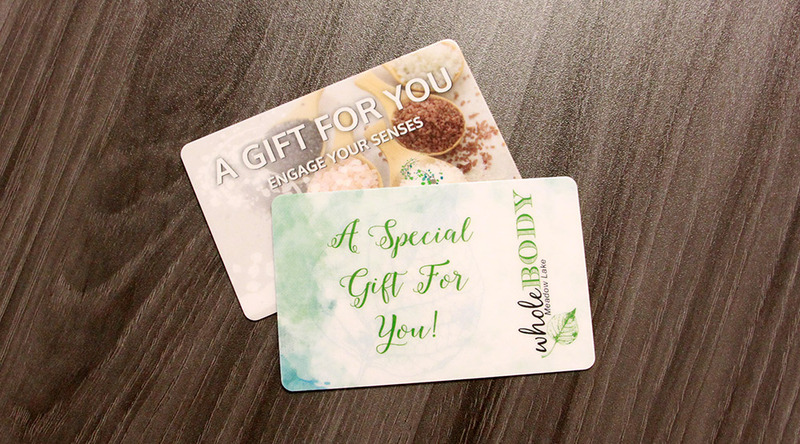 We also offer preprinted and custom printed gift card holders so that your cards make a great impression when they are given out. We offer customized solutions that are tailored to your business’ exact needs. Our plastic gift cards are available in a range of standard designs, but can also be customized in any shape you want. Your plastic gift cards can include a barcode, sequential numbering, or other data for customer tracking and can be formatted to work with your existing software. The surface of our plastic gift cards are a water-resistant polyester core with a protective, durable, and high-gloss laminate designed to protect your gift card from cracks, spills, and peeling.